The Videxio product team has been hard at work making improvements to My Meeting Video. The Android Tablet version is available now - iPad version coming soon! My Meeting Video is a software client that turns your PC, Mac, Android or iOS tablet into a powerful videoconferencing device, allowing you to connect securely in high quality audio and video with your colleagues and business partners across the globe. We have just launched a range of new improvements to My Meeting Video for Android tablets - watch out for the iPad version which will follow soon! You can now join meeting rooms without logging in! Just paste your meeting URL, room address or conference ID when you open the app (if you are not logged in). Join a meeting room without logging in. The app even sometimes knows when you’ve copied a valid link and pastes it in for you! You can add an optional display name when joining without logging in. 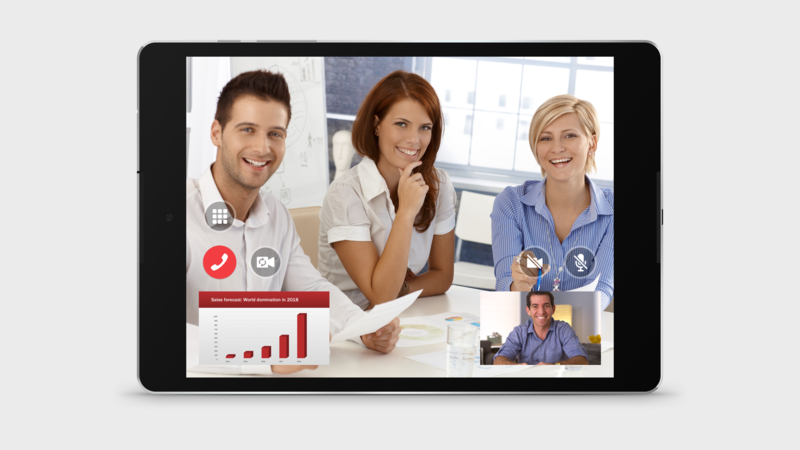 You can now join meeting rooms while only receiving audio and screen shares and sending audio only. Perfect for joining meetings while you’re on the move. You can now disable your camera, microphone or both by default before joining calls. Join a meeting discreetly without making noise or join without showing your surroundings. (NEW) You can now turn your camera on and off during meetings. (NEW) You can now toggle between the front and rear cameras of your tablet. Great for when you’d like to share something during a meeting with the wider-lens back camera. Double tap the other participants’ video to crop out to reveal their entire camera feed. Double tap to crop in again to remove the black bars. Zoom in by pinching after cropping in to zoom in further.